A quick glance at the calendar, and I see that I only have two more weeks of Summer. Don’t get me wrong, I absolutely love my job, but it takes so much of me mentally, physically, and spiritually that I often have little time when I get home to do anything in the way of hobbies or crafts (and I am guessing that those moments are going to become even more scarce once Baby Addie arrives). So, after a little reality check with the calendar, I got myself out of the bed and hit the ground running! I took Miss Lily to the vet (she wasn’t so thrilled about that) and went to Wally World for some supplies! 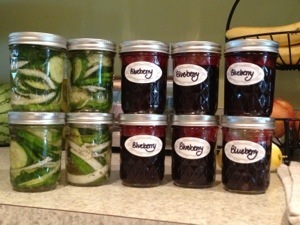 The rest of the afternoon I spent making fridge bread and butter pickles, blueberry jam, and lemon cranberry scones! It was a great day, and I topped it all off with a nice candlelit bath…it really doesn’t get much better than this!